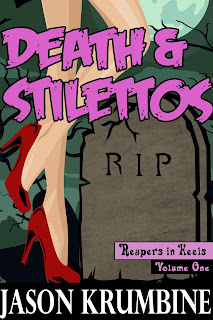 Here it is, the startling conclusion to Reapers in Heels Volume 2! There are two sets of laws in this world: The Law of the Living and the Law of the Dead. And the Graves Sisters are getting caught between them both. Avery’s love life will suffer as she cannot maintain the romance amongst the wickedness of death. Brooke struggles with what she knows to be true and the pursuits of her heart. 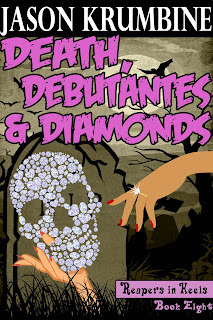 And, for this weekend only, Kindle users can pick up DEATH & STILETTOS for only $1.99. So, if you haven't yet, grab a copy, gift a couple to your friends, and get started on this sizzling series! Remember, you don't actually need a Kindle anymore to download a Kindle book. Thanks to things like apps for your iPad or smartphone or even the Kindle cloud reader, you can download and read a Kindle book anywhere. All you really need is a Amazon account. Jason Krumbine loves to write! He's happily married and lives in Manhattan, NY where he enjoys reading in Central Park, going to movies and discovering new stand-up comedians. You can connect with Jason at either his website, www.jasonkrumbine.com, Facebook, Twitter (@jasonkrumbine) or good ole' fashion email onestrayword@gmail.com. He's always up for a talk about the newest Star Trek movie or what's happening in the world of comic books and TV. Email Me When New Books Come Out!